This entry was posted on Thursday, March 3rd, 2011, 6:00 am and is filed under Changes, Discussion. You can follow any responses to this entry through RSS 2.0. You can leave a response, or trackback from your own site. 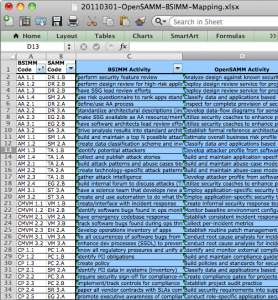 Is this the published/Final version of the spreadsheet that was initially created by Bart De Win? We definitely looked at it, but this was a mapping that Brian and I started and we finished and reviewed in some detail at the working session during the OWASP Summit. As someone who has looked into this stuff pretty closely, what do you think? I fully support the creation of more bodies of work like this as it provides a reference to QA my own research and assists with showing support for reaching a consensus of the touchpoints of BSIMM to OpenSAMM and vice versa.